The Colt 1903 Pocket Hammerless pistol is one of John Moses Browning’s numerous success stories albeit a lesser known one as it has been overshadowed by the reputation of the M1911. But despite being overshadowed the M1903 became a popular small pistol and was adopted by the US Army and Air Force as their General Officer’s Model from World War II through into the Vietnam War in the seventies. The M1903 being ultimately replaced by a compact version of the M1911 from Rock Island Arsenal, the M15 General Officer’s Pistol. 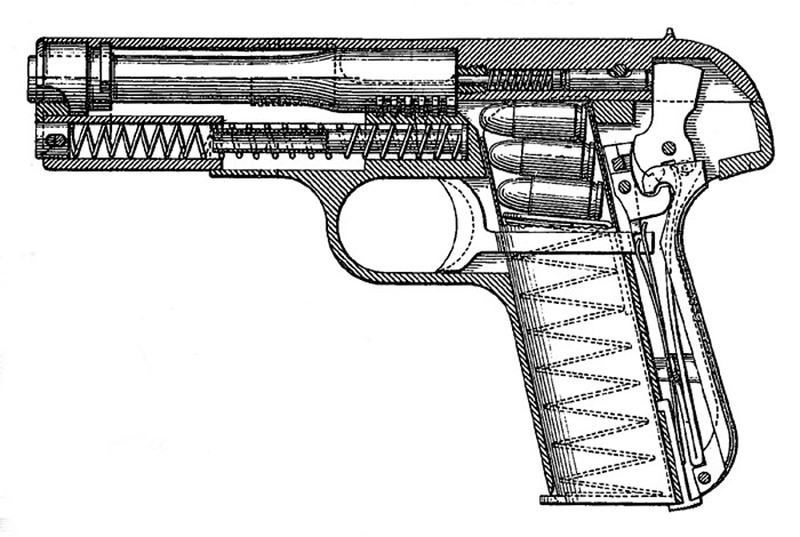 Original patent drawing from John Moses Browning’s patent 747,585 which was granted in late 1903. This pistol was to be made in a number of different versions by both Colt and Fabrique Nationale. (Picture courtesy unblinkingeye.com). John Moses Browning’s original design for this pistol would lead to its being made in three main versions and in three different calibers. The original 1903 Pocket Hammerless was made by Colt chambered for the 32ACP beginning in 1903, and later as the 1908 Pocket Hammerless in .380ACP. 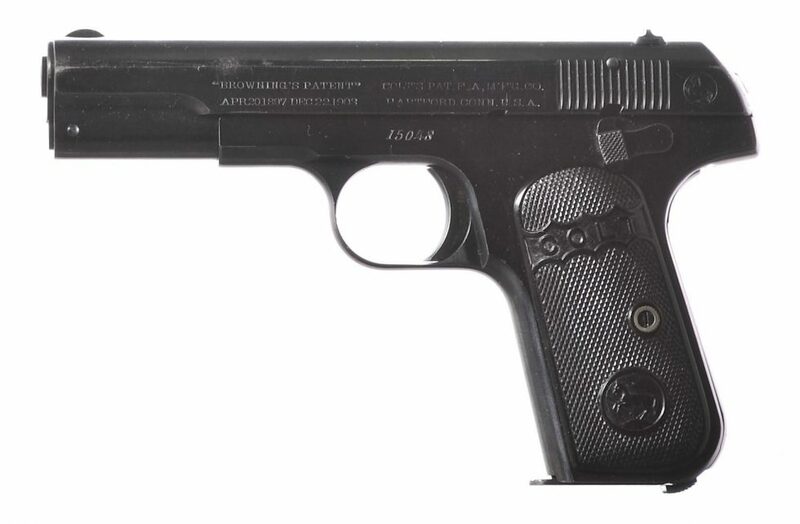 In Belgium however Fabrique Nationale also put another variation of the same pistol into production as the 1903 FN Browning chambered for the more powerful 9mm Browning Long which is better known in the United States and Britain as the .38 Automatic or .38ACP. This pistol was of the same design as the Colt 1903 but was made physically larger to accommodate the more powerful 9mm Browning Long cartridge. The 9mm Browning Long/.38 Automatic had been created by Browning for his Colt M1900 pistol which was not successful. The .38 Automatic cartridge however was of at least equal power to the German 9mm Parabellum and was later re-developed to work at much higher breech pressures to become the .38 Super in the M1911 pistol. (Note: Reloading data for the 38 Automatic/9mm Browning Long is not plentiful but the Hornady Handbook 9th Edition has reliable .38 Automatic data on pages 777-778. Case dimensions are the same for the .38 Automatic and .38 Super so .38 Super brass can be used – just don’t use .38 Super load data for a .38 Automatic or you’ll damage your pistol and likely yourself also. You’ll find the Revivaler post on the .38 Super and the .38 Automatic if you click here). 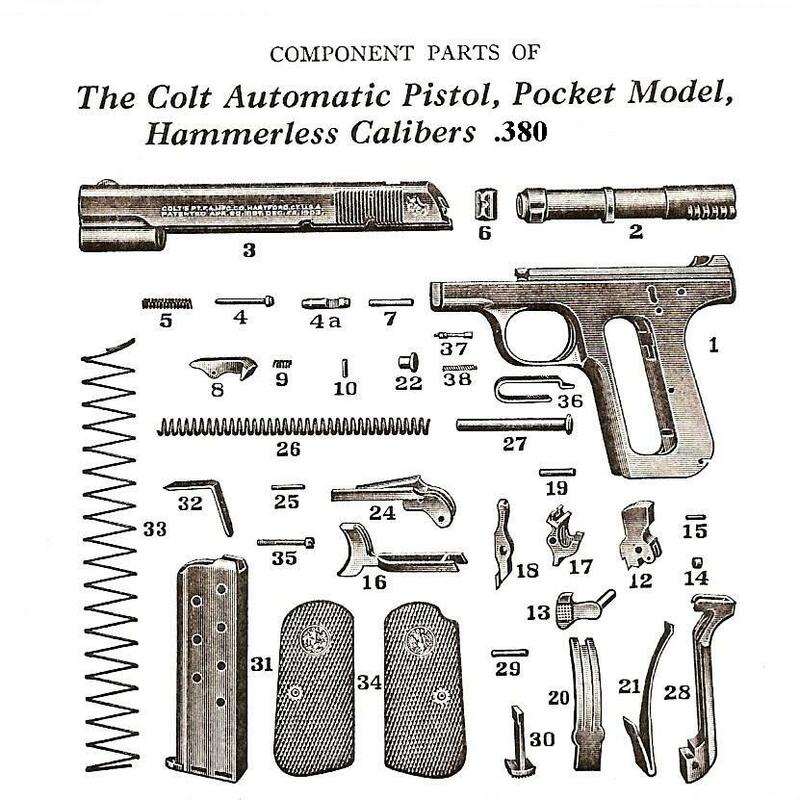 Exploded diagram of the Colt 1908 Pocket Hammerless pistol. The Colt 1903 and 1908, and the FN 1903 are all of identical design, only the calibers are different. The FN 1903 is made physically bigger to cope with the more powerful 9mm Browning Long cartridge. (Picture courtesy coltparts.com). Type I: Integral barrel bushing, 4 inch barrel, no magazine safety, Serial numbers 1 through 71,999. Type II: 32 cal separate barrel bushing, 3 3⁄4 inch barrel; 1908–1910, SN 72,000 through 105,050. Type II: 380 cal separate barrel bushing, 3 3⁄4 inch barrel; 1908–1910, SN 001 through 6250. Type III: integrated barrel bushing, 3 3⁄4 inch barrel; 1910–1926, SN 105,051 through 468,789. Type IV: integrated barrel bushing, 3 3⁄4 inch barrel, magazine safety. Type V: integrated barrel bushing, 3 3⁄4 inch barrel, military sights, magazine safety on both commercial and “U.S. Property” variations. SN 468,097 through 554,446. The Colt 1903 Pocket Hammerless in .32ACP and the Colt 1908 Pocket Hammerless in .380ACP were very popular pistols with people on both sides of the law. Bonnie Parker famously taped one to her thigh and used it to break Clyde Barrow out of jail; and on the other side of the law the Colt 1903 Pocket Hammerless was popular with the New York Police Department and the 1908 even made its way across the sea to China where it was issued to the Shanghai Municipal Police during the twenties and thirties. Original Type 1 Colt 1903 Pocket Hammerless pistol made in 1904 coming up for sale by Rock Island Auction. (Picture courtesy Rock Island Auction). There are a couple of antique Colt 1903 Pocket Hammerless pistols coming up for sale by Rock Island Auction at their August on-line auction to be held on August 10th, 2017. 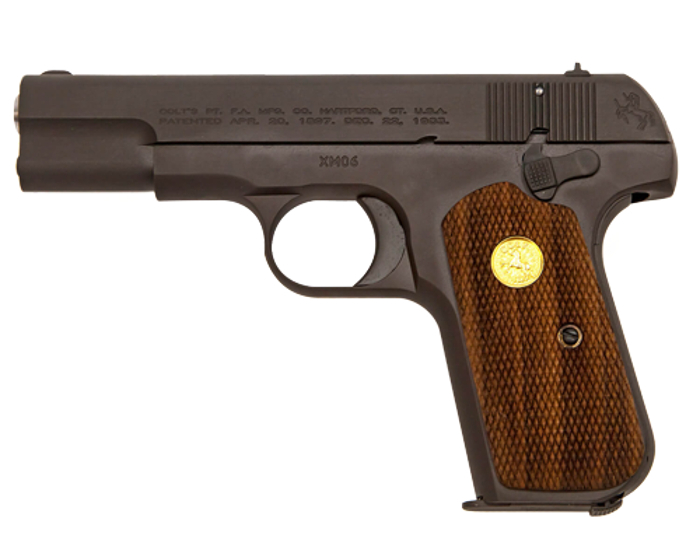 The first was manufactured in 1904 and has serial number 15048 making this a Type 1 pistol. The condition of this pistol is listed as: “OC – FINE: all original parts; over 30% original finish“. The other Type 1 Colt 1903 Pocket Hammerless pistol for sale by Rock Island Auction was made in 1905. (Picture courtesy Rock Island Auction). 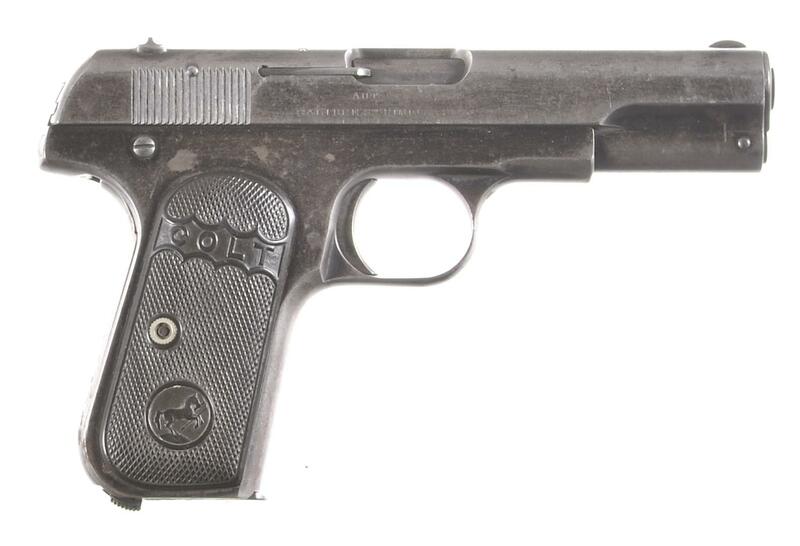 The second Type 1 Colt 1903 Pocket Hammerless pistol coming up for sale by Rock Island Auction was manufactured in 1905 and has serial number 32978. Its condition is described as follows: “OE – GOOD: some minor replacement parts; metal smoothly rusted or lightly pitted in places, cleaned; lightly scratched, bruised or minor cracks repaired; in good working order“. For those looking for a new Colt 1903 Pocket Hammerless pistol the good news is Colt has put this handgun back into production. (Picture courtesy colt.com). There is good news for you if you are looking for a new Colt 1903 Pocket Hammerless pistol; Colt has them back in production as a special edition and you can find them if you visit Colt’s web site. You will find the new Colt 1903 Pocket Hammerless special edition pistol if you click here. The Colt 1903 Pocket Hammerless pistol became popular simply because it was and still is a great handgun. It may have been overshadowed by its larger sibling the M1911 but that hasn’t stopped it from carving out a place for itself in American history, even General George Patton carried one.